The primary reason the Blackhawks are on the cusp of the Cup is do to the spectacular play of 22-year old young gun Jonathan Toews. Toews' 25 points are the most by any player in this years Stanley Cup Playoffs. While the Blackhawks continue to court Lord Stanley's Cup, here's a few Jonathan Toews rookies you may want to consider courting. The cup is the holy grail of hockey cards. 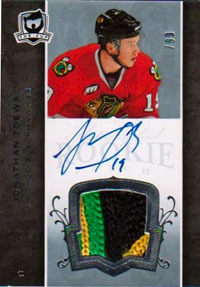 If you can afford the price tag and are a Blackhawks fan, this card is definitely for you. 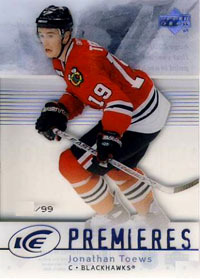 The one knock I have on this card is that 07-08 The Cup was an off year as it pertains to card design. Since the early 2000's, few non-auto rookies have been worthy of sharing a sheet of ice with the almighty auto rookie. Upper Deck Ice not only holds value, it appreciates in value better than most autographed rookies. A combination of low numbering and tradition make Ice one of the most under-appreciated brands in all of cards. For reasons beyond me, SPx always seems to book above Premier. I have never been a fan of SPx due to it's over the top card design, sticker drops, and "sherzee" swatches. Premier on the other hand maintains a crisp, classic design, with well presented jersey swatches and a low print run to boot. Only 299 of this card were made, which makes it an amazing value. Although SP Authentic rookie auto's carry a high print run of 999, there is something universally appealing about the "Future Watch" theme and crisp on-card auto. SP Authentic's value also holds up extremely well over the years. The thing I love about SP Authentic is that it gives the everyday collector a chance to get an extremely cool rookie auto of a great player at a reasonable price. Ultimate Collection is a brand with a cult following, many collectors are drawn to the classy simplicity of the brand. UC is hit or miss with me, I am big on card design when it comes to purchases. 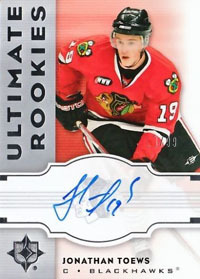 The value and low print on the Ultimate Toews are more appealing to me than the card itself, this was a middle of the road year for Ultimate card design. @youmissedone: You make a good point, unfortunately it’s hard to fit buyback auto rookies into countdowns for the exact reason you pointed out, they are extremely rare. Also, buyback auto’s aren’t considered true rookie year autos, they usually consider them part of the product they came out of, which I disagree with. I think the buyback auto is a great idea that for whatever reason is still a few years ahead of it’s time. I would love to see them do a Brodeur buyback auto, it’s sad that his rookie is only worth $15. Those price are under the market right now, you talk about 5 years ago. 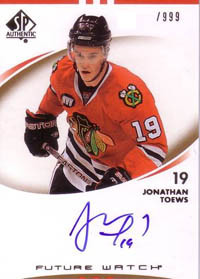 Now in 2016 with 3 stanley cup, you talk more about $5,000.00 to $40,000.00 for a nice The Cup Jonathan Toews rookie card.